Do you want to unleash your inner flower child? This beautiful flower pendant will help you express your love of flowers. Do you love rustic copper designs? Then this copper flower pendant is perfect for you. 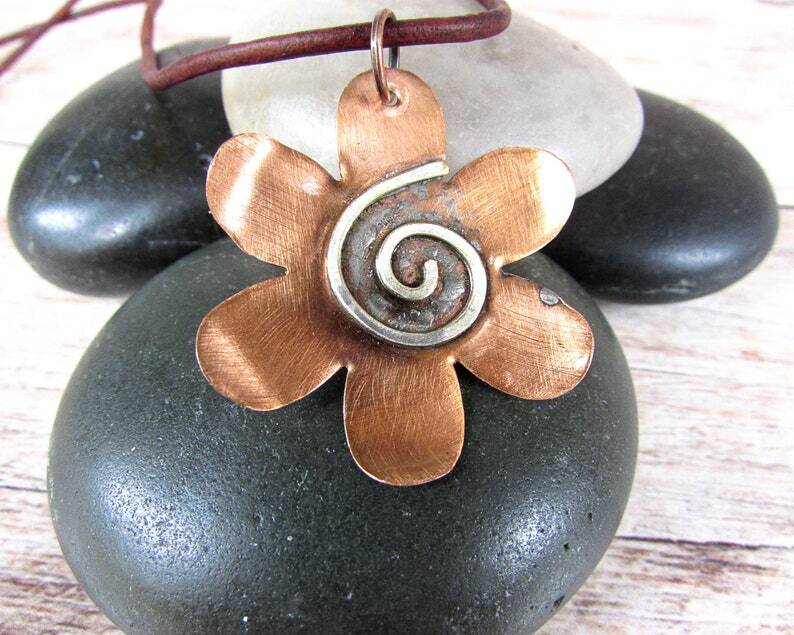 Carefully hand-cut from pure copper, this flower has been polished by hand and all of the edges smoothed and filed. A sterling silver spiral has been expertly soldered using Lead, Nickel, and Cadmium free silver jewelry solder to the center of the daisy. A rustic jump ring has been added to make space for the vibrant oxblood colored 2mm leather cord. The cord has been finished off with matching crimps, jump rings and lobster claw clasp. The pendant measures approximately 2 inches x 2 inches (5.08 cm x 5.08 cm) across. Ready to Ship Length measures approximately 18 inches (45.72 cm). Need a different length? Just select the one you want. We have 18 inch (45.72 cm), 20 inch (50.8 cm) , and 24 inch (60.96 cm) lengths available. Just want the pendant? Simply select "Pendant Only" from the drop down menu at time of purchase. This floral pendant has been quadruple sealed using acrylic shellac to prevent tarnish. This process will only slow down the natural patina process of the copper. 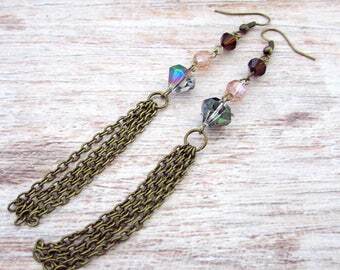 As copper ages, the color changes due to the natural oxidation process of the metal. It is in no way a flaw or defect. If this is an undesired change, simply strip the shellac off using an acetone based nail polish remover and polish the metal. Re-seal the metal using clear fingernail polish or other metal sealer. Please note all photos are taken at close range using the MACROS setting on our camera. This amplifies textures and causes proportions to to distort as well as highlights any normally unseen flaws.